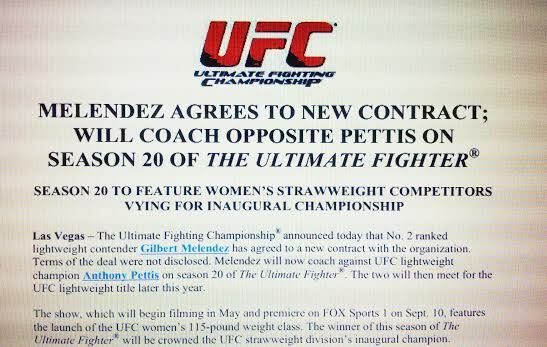 Gilbert Melendez and Anthony Pettis have both been named to coach the female Strawweights on this season’s TUF 20, yes you heard right. Gilbert Melendez has now accepted a new offer from The UFC and one it appears he just could not refuse (again), exact contract details were not revealed but here is the Press Release from The UFC. The Ultimate Fighting Championship announced tonight that No.2 ranked lightweight contender Gilbert Melendez has agreed to a new contract with organization. Terms of the deal were not disclosed. 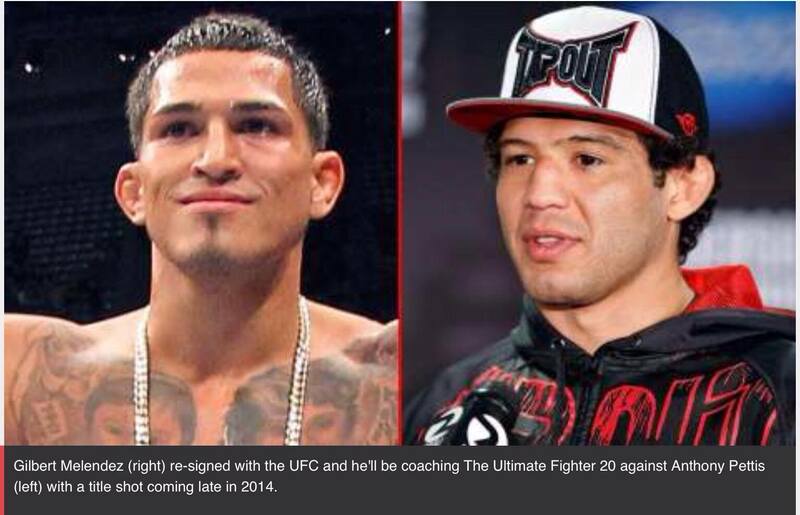 Melendez will now coach against UFC lightweight champion Anthony Pettis on season 20 of The Ultimate Fighter. The two will then meet for the UFC lightweight title later this year. The show, which will begin filming in May and premiere on FOX Sports 1 on Sept. 10th features the launch of the UFC women’s 115-pound weight class. The winner of this season of The Ultimate Fighter will be crowned the UFC strawweight division’s inaugural champion. We last saw Melendez in a toe-to-toe all out war with Diego Sanchez at UFC 166 last October in arguably one of the best fights of 2013, with Melendez coming away with the unanimous decision and ‘Fight of the Night’. The coaching stint on TUF 20 will more than likely give Pettis the extra time for his injured knee which forced him out of his title defense against Josh Thomson back at UFC on Fox 9. I’m going to have a guess that Melendez will bring in Nate Diaz somewhere along the line, which will make interesting viewing if you know the history of the two training camps involved! It’s all about the women come September 10th when we can watch TUF 20 and I for one cannot wait. Previous Previous post: Meet Amateur Fighter Zowie-Marie Trevena – A True Pure Warrior!